SCIENTISTS trying to grow our body parts inside pigs to end the shortage of organs needed for transplants could inadvertently make animals with human brains, it has emerged. 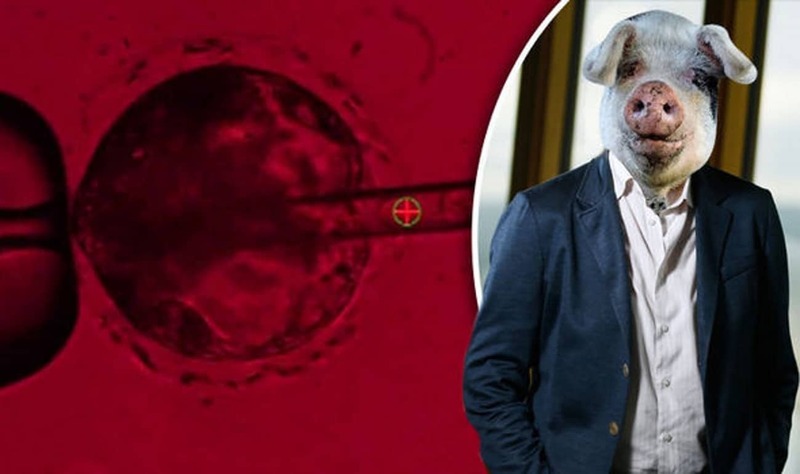 It was revealed today that in a futuristic Dr Frankenstein-like experiment, scientisist in the US have injected human stem cells into pig embryos to produce human-pig embryos known as chimeras. But, concern has already surfaced that playing God in this way could open the door to pig’s developing with human intelligence and too much like us. There are fears that mixing pig and human genes in this way coud see the animals develop looking like animals but with human brains or boosted intelligence. The research is so controversial that last year, the main US medical research agency, the National Institutes of Health, imposed a moratorium on funding such experiments. Its main concern is that the human cells might migrate to the developing pig’s brain and make it, in some way, more human. Pablo Ross, a reproductive biologist who is leading the research, said this is unlikely but is a key reason why the research is proceeding with such caution. Mr Ross, whose team is from University of California, Davis, says the hybrids should look and behave like normal pigs except that one organ will be composed of human cells. But, amid concerns that the human-pig chimeric embryos could develop too much like us, the inch-long embryoes are only being allowed to develop inside the sows for 28 days before the pregnancies are terminated and the tissue removed for analysis. BBC One of the sows who is pregnant with a human-pig hybrid. In Greek mythology, chimeras were fire-breathing monsters composed of several animals – part lion, goat and snake. Other teams in the United States have created human-pig chimeric embryos but none has allowed the foetuses to be born, because of the fears of the hybrid creation. Walter Low, professor in the department of neurosurgery, University of Minnesota, said pigs were an ideal “biological incubator” for growing human organs, and could potentially be used to create not just a pancreas but hearts, livers, kidneys, lungs and corneas. He said if the iPS cells were taken from a patient needing a transplant then these could be injected in a pig embryo which had the key genes deleted for creating the required organ, such as the liver. Alarmingly, his team is also trying to create dopamine-producing human neurons from chimeric embryos to treat patients with Parkinson’s disease. These embryos have been allowed to develop for up to 62 days – the normal gestation period is around 114 days. Like the team in California, Prof Low said they were monitoring the effects on the pig brain: He said: “With every organ we will look at what’s happening in the brain and if we find that it’s too human like, then we won’t let those foetuses be born”. The BBC’s medical correspondent Fergus Walsh was given exclusive access to the research for Panorama – Medicine’s Big Breakthrough: Editing Your Genesto be shown tonight at 8.30pm on BBC One. Creating the chimeric embryos takes two stages. First, a technique known as CRISPR gene editing is used to remove DNA from a newly fertilised pig embryo that would enable the resulting foetus to grow a pancreas. This creates a genetic “niche” or void. Then, human induced pluripotent (iPS) stem cells are injected into the embryo. The iPS cells were derived from adult cells and “dialled back” to become stem cells capable of developing into any tissue in the body. The team at UC Davis hopes the human stem cells will take advantage of the genetic niche in the pig embryo and the resulting foetus will grow a human pancreas. In the mid-90s there were hopes that genetically modified pigs might provide an endless supply of organs for patients, and that cross-species transplants were not far off. But clinical trials stalled because of fears that humans might be infected with animal viruses. Organisations campaigning for an end to factory farming are also dismayed at the thought of organ farms. Peter Stevenson, from Compassion in World Farming, told Panorama: “I’m nervous about opening up a new source of animal suffering.